Morning light hits the peaks rising from Milford Sound, a fjord (yes, it really is a fjord not a sound!) in south west New Zealand. I got hugely lucky with the weather for this shot, as Milford Sound is the wettest inhabited place in New Zealand and one of the wettest in the world. New Zealand is a fairly long way south, which means in winter you can wake up at 7am and still have time to get out and catch the sunset! I drove down in the morning and caught this scene. Perfect weather, a lovely crisp -3 degrees, not a cloud in the sky, brilliantly calm water. Canon EOS 5D Mark II, Canon EF 17-40mm f/4L USM, CPL, Adobe Lightroom. 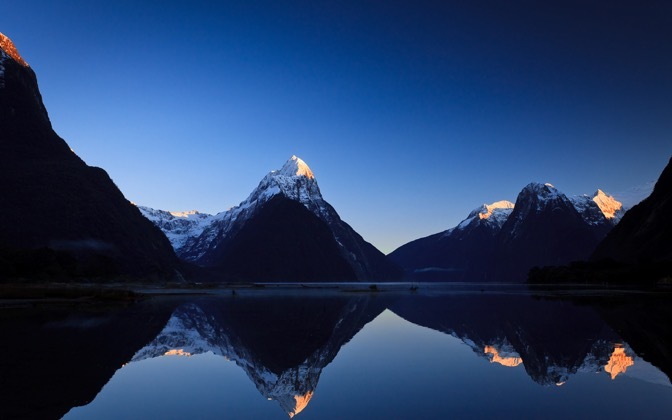 Send a Private Message to the Artist of "Milford Sound Sunrise"